This strategy can be used by any trader with an account size of only 1,000$. However, the strategy performs better and trades more frequently with bigger account sizes. The expert advisor can be short and long simultaneously and appears complex and illogical initially. It will test your patience if your account balance is below 5,000$, because trades will require a lot of pips in profit to be closed. The Euro Trader EA is a Metatrader4 (MT4) Expert Advisor designed to trade EUR/USD which implements a complete and fully-functional grid trading strategy, with trading settings hard-coded into the EA to avoid human error. Boost your trading activity with the most easy-to-use EUR/USD forex robot. All you need is a Virtual Private Server (VPS) and stamina to handle the open trades! You must instruct the EA how much money to allocate into the trading activity and the risk profile, which can be recommended or overleveraged. Both inputs are a drop-down list. 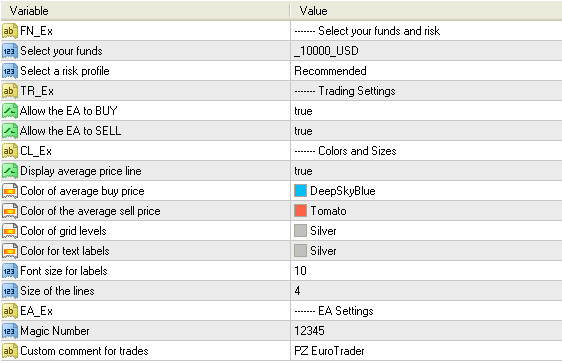 The EA decides when to buy or sell, but you can disable long or short positions. The EA displays informative lines and labels on the chart, which color and size you can customize. Additionally, you can choose the magic number and comment for the orders. Can I trade other forex pairs with this EA? No, you can't. The EA will only trade EURUSD. What timeframe should I trade with it? The EA uses no timeframes at all. Load it into EURUSD at any timeframe and that's it. Can I select the lot size? No, you can't. The EA handles risk management according to your risk profile. How often is the EA updated? This expert advisor has constant updates, every 3-6 months. Is this strategy FIFO compliant? Fully-functional trading strategy designed to trade GBP/USD. No intervention or optimization needed. Fully-functional trading strategy designed to trade XAUUSD. No intervention or optimization needed.